I fly back from Boston to San Diego once or twice a year when we visit my wife’s parents. Logan International Airport is fine. The TSA line is always swift and I’ve learned my way around the Dunkin Donuts breakfast menu. However, there is something that always catches me while I’m waiting to clear the security scan. The people of Boston have hung every banner from each of their professional sports championships in chronological order. It’s a rainbow of accomplishment and it’s something they need you to see on your way out. From the turn of the 20th Century and onto Bill Russell’s Celtics, to the more recent success of the Patriots and Red Sox, a simple fact is inescapable: these people have rings and my people do not. Around the end of April my first born son is scheduled to enter the world. He will be a native San Diegan like his father. As expected though, my wife’s friends and family from Boston have subtly made their pitch to have him root for Boston teams. This isn’t upsetting to me. Being a Boston sports fan feels good for these people and they want my son to experience the same thing. I’ll never stop anybody from making that gesture. I want my son to be a Padres and Chargers fan, but I would get it if he went the other way. He shouldn’t have to wait for his teams to figure it out. Regardless, it’s important that he understands that this will in fact be a decision. There will be no “This is my NL team and this is my AL team” in our dynamic. His choice will be simple. He can either be miserable with me or happy against me. This offseason, after trading closer and Guns N Roses fan Craig Kimbrel to the Red Sox for a haul of prospects, Padres ownership made it clear that an above .500 team would be a successful year. On the surface, this is fine. It’s a reasonable route to take. It will be years before my son will be able to appreciate baseball. They have time to make their case for his future fandom. 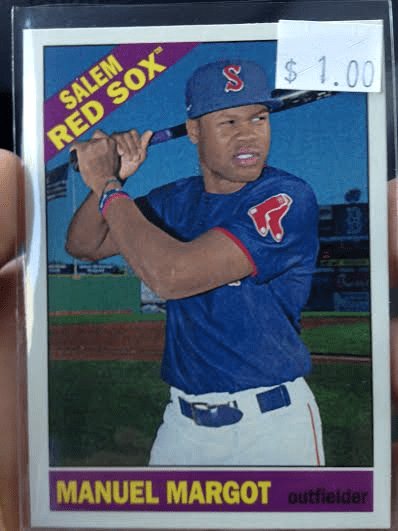 The most intriguing player brought over from Boston is Manuel Margot, a 21 year old outfielder from the Dominican Republic who split last season between Class A and Double-A, hitting .276 with 27 doubles, nine triples, six home runs, 50 RBI and 73 runs. At the time of the trade, he was the third highest rated prospect in Boston’s system. If things go as planned, he could be in contention for being my son’s favorite player. They will have the opportunity to rise together. On August 22nd, Guns N Roses will play Qualcomm Stadium with the original lineup for the first time since they played there with Metallica and Ice-T in late September of 1992. I will not likely be going (See: Above), but I’m interested in hearing about the moment of their set right before they play the song Patience. GNR fans have had a lot of patience with Axl Rose over the last two decades. For a long time it was mostly cornrows and Buckethead. If they play the ballad from their 1989 Guns N Roses Lies EP that depicts the very basic human virtue, I’m curious to see how Axl handles it. Does he simply thank his fans for being patient and make a joke directed at himself? Does he tell them they should be grateful for the band’s return to the original form? How you handle your fans after they’ve given you their loyalty is the biggest part of the responsibility that comes with having fans. I suppose Axl could just play the song. Back in 1992, when GNR were still playing stadiums, I was enjoying the last days of innocence as a baseball fan. I was 12 and the Padres had the All Star Game. Gary Sheffield and the rest of the team’s healthy representation in the mid summer classic were blowing my young mind. A year later the fire sale happened. A year after that, the strike hit and it’s never been the same. With the All Star Game returning this year, it’s hard not to look back at all the patience this community has had with the San Diego Padres. In 2016, they’ve asked for it again with the company line being, “We’re not rebuilding, we’re building.” I’m a lifer, so this is nothing new. When you play the same song, you have to deliver it in the best way you see fit. The baseball card in the photo above will be the first baseball card my son will ever own. When Manuel Margot makes it to the big leagues he will have been developed by the Padres and Red Sox. If things go as planned with my wife’s pregnancy, the first month of the Padres’ young season will basically be over when he arrives and we’ll start our lives as parents. Patience will be tested as we build for the future. On the day my son is born, after I know everyone is safe (knock on wood), I plan on buying a San Diego Union Tribune in the hospital. This will be something to keep for him, but also it’ll allow me to check the Padres’ record. On that day I’ll need to see it in print. I’ll need to gloss my fingers over the truth of what my baseball team is at that moment. Their opening argument needs to land. It’s not that I need them to have a winning record on my life changing day; it’s that I deserve it. Maybe it’s intellectually irresponsible to have these expectations, but I’m a Padres fan. I’ve used my illusions once or twice before.